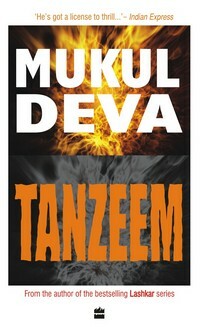 Tanzeem is the fourth and final installment (After Lashkar, Salim Must Die and Blowback) in Mukul Deva’s series of military thrillers. He has written these books at such breakneck speed that he released the 4 books over a span of 4 years from 2008 till 2011. I like many others am in love with his Tom Clancy style writing. And ever since I read Blowback, I was waiting for the day I could lay my hands on Tanzeem. The book begins where Blowback ends. After the confrontation with the heads of the Indian Mujahideen, Iqbal, the undercover Force-22 operative decides that he needs to go into the heart of Pakistan and take out the killing machines with his own hands. Despite attempts by the top brass to prevent him from taking such a decision, he doesn’t heed their warnings and takes on the arduous journey. The rest of the story deals with how he succeeds in finding and befriending the group of terror masters waiting to unleash a wave of urban global terror. Does he succeed? Is he killed? You got to read it. Mukul loves to mix reality with fiction and what you get is a deadly combo capable of creating some deadly controversies. After dealing with Pakistan’s proxy wars and their love of Kashmir in his earlier installments, he focuses Tanzeem on the terror unleashed by groups within Pakistan. The army’s offensive in the Swat Valley, the Indian embassy attack in Kabul, the hand in glove ISI enjoying the support of the Pakistani army, the attacks on the International Security Assistance Force (ISAF) in Afghanistan, US supporting Pakistan with billions of dollars, are all real life incidents. And he brings them alive with this book. You can feel your mind racing through the rugged terrains of Waziristan. You can feel the pain in Iqbal’s heart when he leaves his son. You can feel the anxiety within Iqbal about whether he would be able to take down the terror masters. You can feel how the weapons of each soldier or terrorist look as they come to shred their target to bits. This edge of the seat thriller takes you on an amazing ride you wish would never stop. The narrative is pretty strong and structured. The speed is so pacy that you would want to finish the book in one go. The chapter dedicated to the history of the Taliban’s Russian attack as well as their growth in Afghanistan could have been edited a bit. But then it gives a more deeper look into what actually would have taken place during that period. Iqbal as the Force 22 operative is the heart and soul of the story. On him rests the entire success of the mission and the safety of millions of men, women and children. His anxiety, happiness, pain, despair, hopelessness and finally delight is so beautiful portrayed that you actually start wondering if he is standing right in front of you. Ameer ul Moineem is the dreaded terror master who believes that unleashing a wave of global terror will only lead him to the right path. The others don’t really have much have a role to play. The book is the perfect finale for his military series. And truth be told – Mukul has it in him to be remembered as the best thriller writer in India for a long time to come. ahha,wid such a review, i guess i should read all the series! You should really check it out. Though I am not too sure on whether you would like this genre though. Thanks Aseem for this brilliant review, have added the series in ‘to-read’ list. Keep up the good work. Thanks Mukesh. Mukul has literally given birth to the military thriller genre. I am sure you wouldn’t regret picking up this series :). Nice review.Looks a good option. Aseem I am looking for Indian authors in techno-thriller genre (not esp military) somebody similar to the category of Michael Crichton,Raymond khoury, Douglas Preston which combine ancient history,science and thriller. can you recommend some. Ritesh, actually I doubt we really have authors of the stature of Crichton etc. on the Indian literary scene. From what I can think of, Jims Andrews “Patriot” about sea terrorism is pretty good. Even Amish Tripathi’s “Immortals of Meluha” is regarded as something fantastic :). Actually I recently read “The Newsroom Mafia” by Oswald Pereira, a journalist with over 30 years of experience. The book is a crime thriller with an underlying theme on the nexus between politicians, underworld, police and the press. Would put up the review by tonight. Recently someone told me about “The Haunted” by a Mumbai writer – Douglas Misquarata. Don’t really know how good or bad it is. Probably you could check that one out. I dream of a day when we would have Indian Robin Cook’s and stuff you know. By the way, “The Dust will never Settle”, a techno thriller by Mukul Deva is gonna be out in a month or two. Thanks Ritesh :). Nice to know you follow my reviews.